The Oasis of Hope recently hired a dear brother to be the new manager. He is a local and deeply cares for the people in the village. He brings fresh perspective and energy to the vision of serving the Yazidi community. The previous manager and teacher is about to have her first baby! Her time with Oasis of Hope instilled a culture of care, love, and patience. She remains an overseer for the family center. We are extremely blessed to have such a wonderful staff. After visiting the Oasis of Hope and meeting with the amazing staff, we have seen the urgent need for expansion and consistent utilities. The family center is serving more people than it can handle, and more staff are needed, etc. 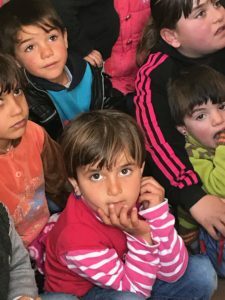 Its popularity and acceptance among the Yazidi refugees and displaced families has caused attendance to increase dramatically. We are currently assessing the possibility of establishing a more permanent site that can accommodate the Yazidi and the local community. We desire to create cultural bridges and see this place bless the entire village. The situation for the Yazidi families is complicated to say the least. Some are leaving to other countries that take them in as refugees. Some would go back to their homes, but their homes have been destroyed, utilities destroyed, and they have no income with which to rebuild. Also, there are several rivaling groups trying to take control of what was once Yazidi land. As if that weren’t daunting enough, due to government oppression in the 1970s, many Yazidi have been denied documentation proving ownership of property. Our hope is to help provide education and support which is needed for them to rebuild their lives, wherever this rebuilding process takes place. Just over an hour’s drive north from the harsh fight for freedom in Mosul, the quiet village of Enishke feels worlds away from the horrors and atrocities committed against the Yazidi people that now find shelter at its outskirts. The pain is always near, however, as many are still missing parents, children and siblings since the destruction of their city (Sinjar) and the capture of thousands by ISIS in 2014. To read more about how we were introduced to this place, click here. We recently visited the “school” we have been supporting as of January ’17. We were met by over 300 children, many parents, and the 12 staff members. 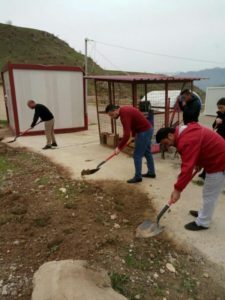 Though the Yazidi have been rejected and despised by almost everyone, they accepted us with smiles and warmth, thanking us for helping the educational space stay operational. A truly profound and important work is being done in this place, appropriately named “Oasis of Hope” by the employees. Children are continuing their education, in spite of being displaced from their homes and society. Adults are being trained in English and other skills to have hope for a future. But most importantly, those attending and in community with this family center are being loved and accepted and valued by the committed staff. Souls are being restored. 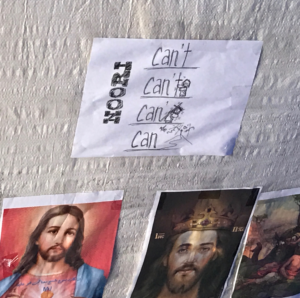 This, in large part, is the result of the culture established within the center by its founders (a Christian aid organization who are no longer involved in the project) and its local overseer, who we will call Linda. She insists on loving and supporting those who attend, even when it’s difficult. ‘Discovering the Bible’ meetings are also being hosted there, exposing people to the story of God’s love through Jesus, and the hope that He brings. 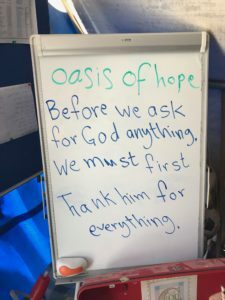 An employee of a large NGO working in Iraq called Oasis of Hope ‘a unique and fruitful work,’ and a needed response to the devastation caused by ISIS. We couldn’t agree more, and we are so honored to be supporting this work and serving the local staff. Through this center, we are truly bringing hope and a future to a people who have been nearly wiped out.